Hi I’m Terminus and I main Berserker and Gunner on Tempest Reach (NA). This is a comprehensive guide that is meant to be useful for both experienced and inexperienced berserkers. Berserkers are an extremely underrated class, but they can be extremely strong in the right situations due to the high raw damage loaded in Thunder Strike being magnified by bloodlust. Update: This guide’s rotations and other sections have been updated with info by Lushy up to NA Tera’s February 28, 2017 patch. We will appreciate any feedback on any sections that could still need updating, or suggestions for the current content, so please leave a comment if you’d like. Why crit power instead of crit factor? With the jewelry recommended in this guide and a boss enrage uptime of 75%: 0.3 crit power gives a 3.7% DPS increase. On bosses with 100% enrage uptime, crit power gives a 3.5% DPS increase. Using a slaying setup lowers the effectiveness of the crit power roll to a flat 3%. With the jewelry recommended in this guide 14 crit factor gives a raw DPS increase of only 1.8%. We can see that the crit power line gives an additional 2% DPS in average non slaying runs and an additional 1% in slaying runs over the crit factor line, therefore it is always better to roll crit power over crit factor as the 4th bottom line on an Axe. Cooldown reduction is not a great stat for berserkers since your main DPS skills are on very short cooldowns and the benefit of a cooldown line is understated on skills with short cooldowns. The cooldown of Thunder Strike is 3 seconds and 7.2% cooldown only removes 0.216 seconds from the cooldown, that ends up not really changing your main rotation at all. The main reason for rolling cooldown would be to lower the cooldown of Fiery Rage to get the Flurry of Blows buff, this is however not as useful as it may seem since you may be unable to use Flurry right as it comes off cooldown if the boss is doing a mechanic. Increases damage of Thunder Strike by 8%. – Thunder Strike is your highest contributing DPS skill and usually counts for 55-60% of your total DPS; this line is simply the best chest line for berserkers and is probably the most valuable chest line in the game. Raises max HP by 8%. The three damage reduction rolls above are the most important rolls on any class and should always be used in PvE. Berserkers have low base HP so the 8% HP helps a lot as the 4th line if you have a VM chest. Keen III or IV Etchings for weapon and gloves provide the highest increase in DPS. Grounded III or IV Etchings for armor and boots provide the highest increase in survivability. Keen etchings outperform pumped etchings mathematically and as stated above cooldown reduction is not a great stat on berserkers which rules energetic etchings out. Note: If you’re running with solo heal priest, you may want to replace the Estateborne Ring/Earring with Blubred or Shadowvain Ring/Earrings. Using Resizing Kits for your jewelry will also boost their DPS stats, so it’s an investment worth considering. Always use these, no matter how much crit factor you manage to stack. 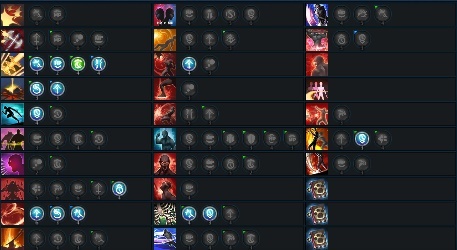 For the purposes of this guide, every mana cost reduction and mana recovery skill will be listed under “Ineffective” due to mana potions & divine infusions being a better choice without the cast time or glyph point cost. Neither of these glyphs are worth having since combo attack itself should never be used. The damage absorbed by a berserkers block (while not in intimidation stance) is much lower than a lancer or brawler and should not be relied on for very hard hitting attacks, it is however very useful when blocking boss attacks that stun or stagger you but do not do a lot of damage directly. Determining which attacks can be blocked and which can’t is a part of the learning curve when playing a berserker. None of these glyphs are worth using when DPSing. – 30% chance to increase power by 20% for 5 seconds on a successful block. – Restores 3% of MP on a successful block. – Increases damage of Axe Counter by 25% for a few seconds. – Reduces MP cost of Axe Counter by 115 for a few seconds. Charge up your Axe by holding down the skill button, then release it to attack. Charges to three levels. Overcharging beyond the third-level charge will damage you. The maximum damage occurs after the 4th tick of self damage and therefore should be released right after to maximize damage without wasting any additional charge time. This is the highest DPS skill for a berserker and will usually do 55-60% of your total damage. It should be prioritized over everything else at all times. – Doubles the chance to crit. – A very important glyph to have, while it doesn’t truly double your chance to crit it does increase it by a significant amount. – Eliminates slowed movement restriction. – This is the single most important glyph for a berserker, it allows you to reposition and dodge attacks while charging. Using this glyph effectively can ensure that your Thunder Strike has 100% back time while also allowing you to continue DPSing in times when most other melee classes can not. Pound the ground, knocking down targets within 4 meters. This skill activates faster when following Staggering Strike, Raze, and Punishing Strike. – Increases attack speed of Flatten by 25%. – Increases skill damage by 30%. Increase your movement speed by 50% for 15s. This skill is very useful for repositioning and dodging certain mechanics that can be walked out of, it also synergizes very well with charging Thunder Strike. Make a sweeping attack that briefly stuns and turns your target around. This skill is useful in PvP and for fighting BAMs however it should never be used against bosses since most bosses will resist stuns outside of specific mechanics. – Reduces MP cost of Flatten by 63 for a few seconds. – Decreases cooldown by 20%. Your warlike shout has a chance of staggering enemies within 7. You become immune to knockdown and stagger for 12, while greatly increasing your resistance to weakening effects. This skill is useful in PvP, but is more situational for the KD and stagger immunity in PvE as lately a lot of endgame bosses do not inflict these effects. However, it can be used for speeding Cyclone’s charging, which can be weaved into a rotation. – Increases damage of Staggering Strike by 25% for a few seconds. – Speeds charging of Cyclone by 30% for a few seconds. – You may or may not take this glyph in favor of a more defensive build, but it is used in the rotation we recommend in this guide. Increases your base Power by 20% and base Crit Factor by 10%, but decreases your Endurance by 10% for 27 seconds. Also sacrifices a portion of your HP to activate Flurry of Blows, which increases attack speed and charging speed by 40% for 10 seconds. This skill used to be separate from Flurry of Blows in the past, but both buffs have been merged into Fiery Rage. As such, this is your single most important buff and key to high DPS. The Fiery Rage part of the skill isn’t as great, 20% power is only 15 flat power and 10% crit factor is only 5 Crit Factor, you mainly want to make use of this skill for the Flurry of Blows buff. This skill shouldn’t be used off cooldown mindlessly, it should be used when you can ensure maximum DPS uptime for the initial 13.5 seconds (glyphed) of Flurry of Blows. – Reduces MP cost by 60. Charge up your attack by holding down the skill button, then release it to spin your Axe in a circle. Charges to three levels. Overcharging beyond the third-level charge will damage you. While charging up, you can move at half speed. This skill will draw normal monsters in. The maximum damage occurs after the 5th tick of self damage and therefore should be released right after to maximize damage without wasting any additional charge time. This is the second highest DPS skill for a berserker and will usually do 20-25% of your total damage. – Increases additional over-charge damage by 24%. – Doubles the chance to crit. – Increases charging speed by 30%. Jump at your foe and smash downward. Knocked-down foes take 5x damage once you learn Merciless Leap. This skill does mediocre damage however it is a very good skill for mobility and the ending animation can be canceled with block to make it even faster mobility. It does not require any glyphs to be useful however since it will never be used for anything outside of mobility in PvE. – Increases skill damage by 25%. – 30% chance to eliminate cooldown. – Only useful to be a goof in town while idling. – Speeds casting of Lethal Strike by 30% for a few seconds. Sacrifice HP to gain 617 MP. This skill gives a pretty significant amount of mana back; however, it has a very long animation lock and is never worth using when fighting bosses. – Decreases HP consumption by 50%. – Increases knockdown by 10% for 20 seconds. – 25% chance to activate Flurry of Blows I. – Decreases cooldown by 25%. – As your HP decreases, your skill damage increases [up to 4 times]. Charge up your Axe by holding down the skill button, then release it to attack. A portion of the damage returns to you as healing. Charges to three levels. While charging up, you can move at half speed. Activates faster but with less healing if you first overcharge Thunder Strike, Cyclone, or Lethal Strike. This skill generally does 4-5% of your total DPS, it should be used only after Thunder Strike and only if Cyclone is on cooldown. – Increases damage of Lethal Strike by 20% for a few seconds. – Only useful when doing a Slaying rotation, as this will greatly boost the damage of Lethal Strike, which is further boosted by being low HP. If you are not gonna be Slaying do not use this. Monsters within 5 briefly run away from you. Fear effect ends if target is knocked down. In PvP, Fear effect ends if target is attacked. Mostly a PvP skill extremely situational PvE uses. Charge up your attack by holding down the skill button, then release it to attack. Costs HP to use, not MP. Only charges to two levels. While charging up, you can move at half speed. This is normally a terrible DPS skill but it is very useful for quickly moving short distances. This moves you faster than leaping but the animation lock at the end makes it slower than leaping strike overall. If you are low HP, the damage and crit chance of this skill will be higher (200% damage at 15% HP and below), which is key when using a Slaying crystal. – Eliminates slowed movement restriction. – Increases skill damage by 30%. – Only use this if Slaying. Call on inner reserves to instantly replenish 900 MP. Increases resistance to stun immensely for 5 seconds. Adds Triumphant Shout buff, which stops MP decay for 22 seconds. The Triumphant Shout skill was merged into this one. This is mostly a PvP skill to resist stuns however it can be useful when mana is being an issue in PvE (we’d recommend you use mana potions instead) or when soloing, usage is not recommended in groups and as such we recommend to not use any glyphs from here. – Reduces MP of Dash by 75 for a few seconds. – Doubles balance for 15 seconds. – Increases endurance by 16 for 12 seconds. – Immediately restores 12% of your total HP. – 50% chance to regenerate 6% of your total MP every second. Briefly slows movement of targets within 5 radius by 62%. Prevents other players from using evasive and movement skills. Mostly a PvP skill, very limited PvE usage. – Increases effect duration by 30%. – Speeds casting of Flatten by 30% for a few seconds. Your Power increases by 29. Your Balance Factor and Impact Factor increase by 60%. Activates Flurry of Blows II, which increases attack speed and charging speed by 40% for 10 seconds. Additionally, damage to monsters increases by 10%. Lasts 30s. 30 seconds of increased damage – This skill should be used along your brooch and mystics Contagion if you are running with one. The free Flurry of Blows buff shouldn’t be stacked with Fiery Rage’s Flurry of Blows as it will merely refresh the timer. In a future patch, the Flurry of Blows that comes with Bloodlust will be removed, so enjoy it while it lasts. – Reduces MP cost by 150. Interrupt a charging skill with a rolling dodge and then follow up with a rib-rattling uppercut attack. The dodge requires one press of the skill button. The smash requires another press of the skill button immediately after. The smash’s damage varies based on the level of the charging skill interrupted. Shares a cooldown with Evasive Roll. This skill is useful to use when you have to dodge or re position while charging Cyclone or Thunder Strike. It is a DPS loss to use this for any other reason. Knocks down monsters around you while moving forward. Enemy players are staggered. Doesn’t knock down any bosses, however it does a decent amount of damage and allows you to chain into flatten. Casting ‘Raze -> Flatten -> Thunder Strike’ allows you to get a fast cast of flatten while also allowing you to take advantage of the Thunder Strike charge speed glyph. – Increases casting speed by 25%. – Increases MP replenishment by 20%. Spin your Axe to hurl a bolt that knocks down an enemy up to 18m away. This is your lowest priority Filler, you should use it if Raze, Flatten, Thunder Strike, Cyclone are all on cooldown or if you’re unable to walk towards the boss while charging Thunder Strike. – Increases combat Movement Speed by 20 for 15 seconds. Fueled by rage, your HP won’t go below 1 for 8s. You can still die if you receive a single blow that exceeds your max HP. This skill is an iframe on cast and is useful if you get caught out without an iframe. – Increases effect duration by 20%. – Decreases cooldown by 50%. Dodge your enemy’s attack. Shares a cooldown with Evasive Smash. The cooldown reduction glyph for this skill was removed as they added the reduction to the skill itself. That glyph was moved to Evasive Smash, in case you were wondering! Deliver a crushing counterattack after a successful Axe Block. Increases resistance to knockdown and stagger, and any damage taken while attacking is reduced by 50%. Can only be used while Intimidation is active. – Provides 100% additional aggro. Charge up to 18m and attack your enemy. Attack has a high chance of knockdown against monsters. Good mobility skill but it’s generally safer to use this when running towards the boss instead of away since it will target the boss model if you’re standing too close. – Increases combat Movement Speed by 10 for 7 seconds. Perform a quick strike that generates high aggro. Press the skill button again to dash forward and attack a second time, decreasing the target’s Endurance. Can only be used while Intimidation is active. This skill is exclusive to tanking and is not relevant for this guide. – Reduces MP cost by 25. Bloodlust -> Brooch -> Fiery Rage after first Flurry of Blows ends. > Here is an example of the rotation currently suggested in this guide. > Here is an old example Flurry rotation during Queen’s shield phase (Note: This uses the old rotation before the skill updates to the class). The reason that we skip the first Cyclone is because the charge and cast speed without Flurry is slow and will delay your second Thunder Strike. If at any time you’re interrupted during filler and your Thunder Strike comes back off cooldown you should prioritize casting Thunder Strike again and skip the filler. As you can guess, this implies that any time you have to interrupt your rotation or break away from the boss for any reason, Thunderstrike should be your priority skill when re-engaging the boss (or Evasive Smash if you charged one to deal with an attack or mechanic). Basically give priority to VB -> LS and otherwise priority to Thunderstrike over Cyclone while VB and LS are on CD, and keep Flurry of Blows up. – Using Vampiric Blow after Cyclone is a DPS loss, since it delays your Thunder Strike, never use this skill chain. However, when using a Slaying rotation with the powerlinked Vampiric Blow that increases Lethal Strike damage, this chain becomes valid. – This skill chain may seem appealing however Flatten should only be used after Raze since Staggering Strike has a long animation that cannot be block cancelled. The ending animation of most skills can be canceled with a single tap of block, the easiest way to do this is to simply hold down the block button at the end of specific skills like Thunder Strike and then release block as soon as you see your character begin to cast it. Block cancelling is essential to maximizing DPS as well as improving your survivability. There’s a common misconception that berserkers are very bad with high ping, but in reality they are one of the best classes for high ping players. The only parts of a charged skill that are affected by ping are the time taken to start charging, the time taken for the skill to hit after releasing and the time taken for a block cancel to occur. However the even though you have a delay when releasing, due to the nature of charge skills the release delay doesn’t affect your DPS at all since you can simply release your skill earlier than usual to make up for the delay. For example, a player with 500ms ping can simply release Thunder Strike 0.5s before the last tick, which means he will end up charging for the exact same time that a 10ms player would since the 10ms player will release right after the last tick. This takes a little bit of practice and requires stable ping to be effective if your ping is fluctuating you won’t be able to effectively predict the delay. Start out with your secondary weapon set that has the first brooch you’re gonna use. – While holding the evasive smash charge you can now swap to your primary set. – You hit the boss with the stored evasive smash charge and minimal time wasted. One of the most important things to keep in mind while playing berserker is the mentality that any time spent charging is indirectly time spent damaging the boss (as long as you land the final hit). Use Dash if it’s off cooldown and start charging Thunder Strike while walking towards the boss. Always remember that Thunder Strike has an 8 meter range and that means you’re practically a mid ranged class when using it. With February 28th’s patch, the AoE impact of Thunderstrike is shown when casting the skill, making this more intuitive. Berserkers have limited iframes, but that doesn’t mean they have limited ways to dodge attacks or chase enemies. Lethal and Leaping strike can both be used to move a small distance in a fast amount of time to dodge an attack without having to iframe it. Since using skills like leaping strike, lethal strike and evasive roll all require you to not be charging any attacks, you should remember which mechanics you can simply walk out of while charging Thunder Strike. The following are old gameplay videos of berserker in endgame content. While a few things vary from today, such as Fiery Rage being a separate buff from Flurry of Blows, the general idea of how the class flows remains. Yes, every HP tick of overcharge gives additional damage. I can’t remember exact value right now but it was about ~80% per whole overcharge ? Do note that you can release sooner than auto release – only the HP ticks give damage. I did not see any stats for gloves and boot rolls. Did I miss it somewhere in your guide? Hi, im following the guide for my berserker and I have a question..
Why in every video & stream I see, zerk hits 2m minimum (no crit) with TS while I hit legit 200k or something.. Even my crit don’t exceed 8m while all their crits are way much damage.. I just got my Misery set (the new t11 set) to +12 and I got etchings and everything, i have (with the battle potion) +73k attack and +282 crit factor and I still don’t do much damage, is there any explanation? I think Misery set is pretty good (not as good as Ambush but still, I want to be doing damage, at least 1M/s, not 300-500k in 417-423 dungeons)..
That’s because the new dungeons the boss have had their Endurance buffed like crazy. I used to do 10 mill crits now I only do up to 5-6m, so don’t worry about it that’s just old content. Following this guide I only get like 380k/s in Guile. Am I doing something vitally wrong or is this the state of zerk dps right now? It seems like zerk dps is impossible to sustain if you have to block or dodge at all. Berserker is a difficult class, with a high skill floor and a high skill ceiling. If you are looking for an easy class that doesn’t require much effort to reach high dps, you may want to consider a different class. Hi. Talking about exclusively PVE, is there any considerable difference between the Elin and the Castanic? Does it worth the race change from Elin? Thank you. I see the recommended rolls for chest and weapon, but how about gloves and boots? Glove and boot rolls are same across all dps classes. Crit, Power and Attack Speed for glove. Movement Speed, Endurance and Mana for boots. I find using Vampiric Blow right after TS to be really really slow, am I doing something wrong? Also I noticed in your Block Cancelling section you did not place a block cancel between the TS and Vampiric Blow, does it affect if I cancel first then Vampiric Blow? Make sure you are fully charging TS. Vampiric Blow chains quickly immediately after a fully charged TS. Do not use block between since that will not allow the fast chain. If VB is casting slow for you, double check that you are fully charging TS and not using other skill between TS and VB. Seems I was not fully charging it! Thanks for the tip~! Hey there. Thank you for taking time to make this guide possible. I just wanted to make sure about the accesories on my zerk……so are they 2 estate and 2 manor accesories? (I mean 1 manor ring and 1 manor earing. And 1 estate ring and 1 estate earing? Thank you so much. Thoughts on 4th cdr roll after flurry got merged with fiery rage? Sometimes I fell like I’m too slow compared to other zerkers every video I see they attack faster then me all the time. This might depend on your latency (ping), or your gear. In PvE, you get all necessary attack speed without building extra from your jewelry set and attack speed line on gloves. Also, it bears to keep in mind what kind of content the berserker you’re watching is doing. If it’s unequalized PvP, they likely have built extra attack speed through etchings and/or weapon rolls. There’s also Flurry of Blows buff to consider. Myself as a player on 150-200 ping I don’t feel that much slower than other zerkers. Of course, I can’t pull off the same speed as low ping players but it’s still enough to do decent DPS and I don’t feel too clunky. ummmm all your glyphs are wrong can you possibly update this? i think they updated the game and the glyphs cost more now to use them. The glyphs are not wrong. You might be missing some master glyphs that reduce the cost of current glyphs. Mouse over any glyph and it’ll show you if you’re missing a better version. Hey, I was wondering if it was possible to check out your keybindings? I have a question. Won’t having power be the base instead of crit factor? Cause crit factor will just be your raw power and not really a big boost in dps? Hey what do you roll on brooch? all crit/power or all crit? If I am running a non-VM weapon which rolls should I take for the bottom 3? Huh. You use Lein’s Rootbeer on all of your boss fights? Hi Terminus, what if I’m using double crit jewelry, is 0.3 crit dmg worth it? Hey there, do the races make a difference in the gameplay ? Like shorter animations and stuff like that. 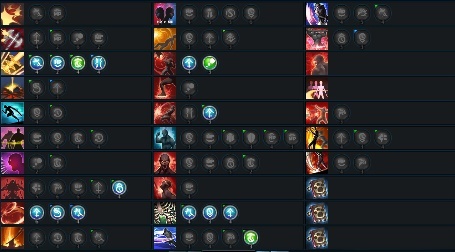 I mained Zerker a long time back, giving up after WH Patch. if I remember at the time, having certain skills chained together was better at the time..blah blah blah, So I’m a bit behind on what’s the best chain skills. 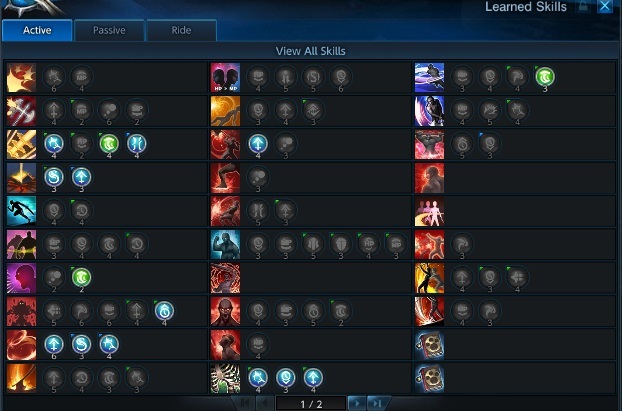 I was wondering what your Chained Skills Page looks like, because I started a new account being I lost my old one, and I couldn’t remember off the top of my head which ones changed over time, which ones stayed, etc. There’s not really much use for chained skills (I’m assuming spacebar? ), especially on a Zerk. It’s better to just use skills manually. The only chained combos you’ll be using are TS > VB and Raze > Flatten. Everything else would be casted manually as shown in the Rotations section of the guide. For me, it was more of a way to guide me on what to press next so I can see it mentally, so I knew what’s the best after. I banned myself from pressing spacebar waay back when I quit, though sometimes when ya brain fart, having the reminder pop sometimes helps. Thanks though. The DMG icnrease on SINGLE CRIT with 0.3 crit power on weapon is 3.68%, I don’t main zerk but im pretty sure u dont always get 100% crit chance, so the actual DPS increase is lower than 3.5%, prob between 2-3% and crit factor is exchangable for power so the 14 crit factor = 7-8 power, the question now is if the 7/8 power<0.3 crit power for a berserker :p.
With the gear recommended in the guide and a Priest in your party you end up with 294 power total with fiery rage on and power charm and no heavens elixir. The formula for dps increase of 1 power is here : http://i.imgur.com/OAbF6FQ.jpg if we replace P with 294 and replace 101 with 108 (to simulate 8 power) we get (294+108) / (294 + 100) ~= 1.020 which is actually only 2% increase in damage. Also the DPS increase is calculated based on the damage contribution while zerk’s on average may only get 75% crit rate on skills the proportion of damage dealt by crits and damage dealt by non crits is closer to 95% since your crits do 8x more damage than your non crits. Hello Terminus, I watched your video on SSHM first boss. When the boss was almost down and he did the shield mechanic, did you use Leaping Strike then Evasive Smash right after? If yes, how did you do that? Most of the time if I do something else I can’t release my Evasive Smash charged damage. When you use Evasive Smash to roll, you receive a 5 seconds buff. Those 5 seconds are the amount of time you have to execute the actual hit of the skill. You can do anything in between, so this is actually a very good thing if used correctly when the boss is far away or it has forced you to retreat for a couple seconds due to a mechanic or whatever. You just have to press the Evasive Smash key again. The issue with many zerkers is that they use the chain button (spacebar) after rolling for the hit part and miss the memo on this (not saying it’s your case). Do you think its still worth playing zerker these days ? I started playing TERA about a month and my first choice was zerker. I know im new but what should i do ? Im using full Dreadnaught +12 and the rolls are almost fine. What do you think i should do to improve my game play ? Berserkers are in a pretty decent state right now but they dont offer anything to a party other than raw dps (no debuff or infuriate etc). So if you cant pull your weight as a DPS when playing berserker then its not worth it. The best way to improve is to keep practicing, if you dont want to put the time into the class (not everyone has the time) then you can consider re-rolling. In general you should be 5-10% lower than ninja DPS, you should however be doing more DPS than warriors / gunners / slayers and basically every class that isn’t a ninja.